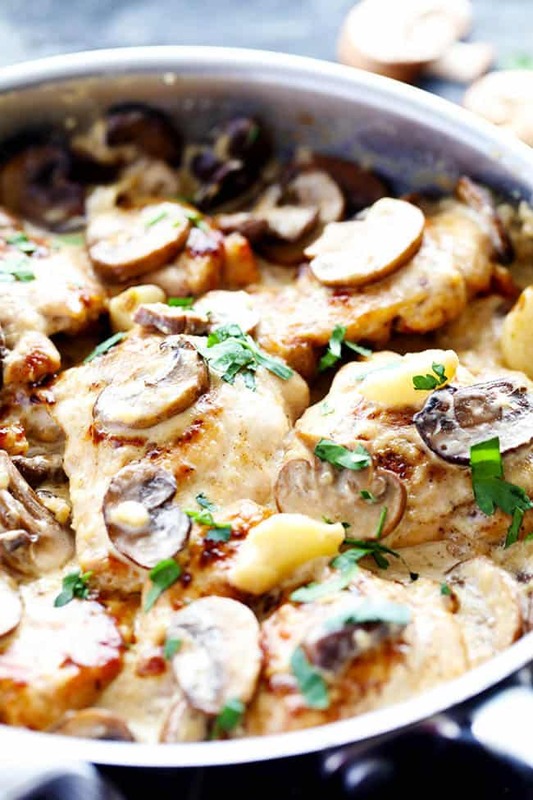 Tender and juicy chicken in the most amazing creamy and delicious garlic mushroom sauce! This makes one incredible 30 minute meal! I have been pretty obsessed with creamy delicious skillet meals lately. But my family LOVES them. I always have most of these ingredients on hand. I buy chicken and heavy cream in bulk from Costco and I have a delicious real ready in under 30 minutes. 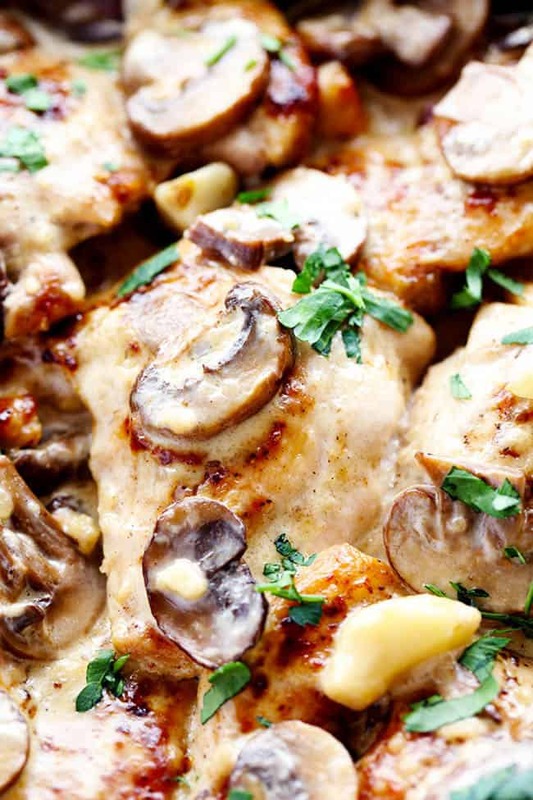 This Creamy Garlic Mushroom Chicken became one of our favorites. You guys are going to LOVE the creamy sauce over the chicken. It is full of flavor and is thick and creamy and so delicious. This is so good that it tastes like it came straight from a restaurant! I am not a huge mushroom fan, but if you stuff them, or put them in a sauce I absolutely love them! These mushrooms added a new texture and awesome flavor to the dish. I mean just look at all of that creamy delicious garlic mushroom goodness! I couldn’t believe how delicious this meal turned out. Quick, easy, delicious and full of such delicious flavor. What is not to love about this dish!? You guys are going to love it just as much as our family did! In a large skillet add olive oil and cook the chicken on medium high heat for 3-5 minutes on each side or until brown on each side and cooked until no longer pink in center. Remove chicken and set aside on a plate. Add the sliced mushrooms and garlic and cook for a few minutes until tender. Remove and set aside. To make the sauce add the chicken broth, heavy cream, cream cheese, garlic powder, salt and pepper. Cook over medium heat and whisk until smooth. Add the flour and continue to cook for 1-2 minutes until it starts to thicken. 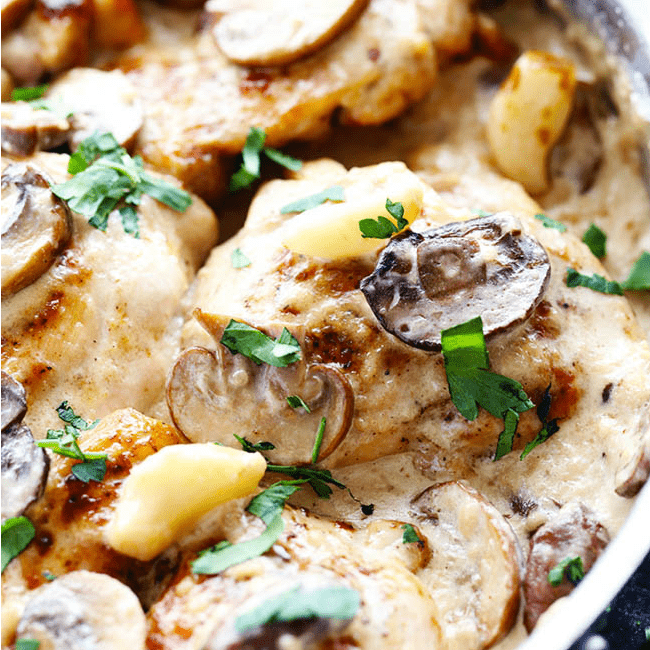 Add the mushrooms and garlic to the sauce followed by the chicken and coat in the creamy sauce. Heat for a couple of minutes and serve immediately. So is that parsley on top? The recipe never mentioned it. I was wondering the same thing? Parsley, Basil ????? Did anyone try this with Basil or Parsley, I think Parsley kinda goes with anything but I am a huge Basil Fan and wanted to see what others thought if they used it in this. the picture looks more like fresh chopped parsley to me, but i bet basil would taste great too. I rarely comment on recipes, but I’ve got to leave one here because this dish was so simple and DELICIOUS! Is there anything higher than 5 stars? My husband licked the entire plate and even my 18 month old enjoyed it! The sauce was amazingly simple and complemented the chicken beautifully. This will definitely be a part of our monthly menu. Loved it. Thanks for the recipe. It is so simple and so delicious. Does anyone have any ideas on the nutritional value of this? I appreciate it. Thanks! I’m really inexperienced in the kitchen, but this recipe was so simple and easy to follow that even I ended up with a delicious meal!! Thanks for sharing! i tripled everything except for the chicken. And served it over spaghetti noodles. It made for a excellent mushroom and chicken pasta, hooray!! Thank you for this great recipe, the sauce is amazing! I have made this twice in the same week it’s that good! I tweeked the recipe a bit by adding onion, onion powder, a little more cream cheese, some chicken gravy mix to help thicken it and parsley. I used Portabella mushrooms to.Served it over rice. tasted great. There’s no need to be a glutton. There is no need for cream cheese in this recipe. Drives me crazy when people add cream cheese to everything. If you add heavy cream alone, this dish will still be amazing. That’s the beautiful thing about heavy cream, it thickens will its cooking. Eliminate the cream cheese and flour and you will be mine. They are using parsley but if you want to add an herbal with flavor, try Italian parsley or basil. Super simple recipe and very tasty. I used light cream and omitted the flour. I added a small bag of ricotta stuffed gnocchi (I boiled from frozen for 3 minutes) and two handfuls of baby spinach during the last 2 minutes of cooking. Finally, I finished with a swirl of a small pat of butter – about a teaspoon. So simple yet elegant, delicious and very satisfying. Next time I may grate a tiny bit of nutmeg on top. I’d give the recipe more stars if I could! It doesn’t say to slice the chicken breasts crosswise but I would think you should. Instead of heavy cream will evaporated milk will do? Sorry you got a rude response to a reasonable question. I’d recommend sticking to heavy cream- evaporated milk does not thicken like it does and the flavor would be significantly different. I used coconut milk creamer and lactose free cream cheese. Came out perfect!! Delicious!! Even easier.. use alfredo sauce! Do you need to cook the mushrooms first at all? * I did add some dried parsley and omitted the flour since the sauce was thick enough for me. This was absolutely delicious I made garlic roasted potatoes with it . My kids loved it . Thank you for sharing the recipe. Alyssa, this meal was terrific. Thank you! It will definitely be a “go to” meal for my family. Keep up the wonderful recipes! One other thing, make this with thinly sliced chicken and you’ll feel like you’re at an expensive restaurant. it tastes so good! Thanks for the awesome recipe! So delicious!! The sauce is amazing! I made it with rice and poured the sauce all over everything. I can’t wait to make it again! Thank you for sharing! I’ve never been a huge fan of mushrooms, but my boyfriend and his daughter looove them so when I saw this recipe I had to try it. AND OH MY LANTA WHAT A HIT! They loooved it and so did I! I’ve made it twice already in the last two weeks. This will definitely be a new go to meal! HI Wanting to try this out. However it says serve immediately does that mean that I can’t have leftovers??? Can this be put in freezer? this is truly a staple i my home. and we have even modified it and have used shirmp and even italian sausage. i make this at least twice a month. a magical plant. Thank you for sharing those mouth-watering recipe. Will surely give it a try. Dish didn’t look anything, not even a little bit like picture. If you love Alfredo you’ll love this. My Alfredo loving family members thought it was very good. This recipe knocked our socks off! I made a few small tweaks based on my cooking style which I’ll share just in case anyone else wants to try. Cut the chicken into uniform sized pieces after flattening with a meat hammer. Cook chicken 3 to 4 minutes on one side in a cast iron skillet, then flip and COVER so the liquid stays in the skillet. Cook another 3 to 4 minutes until cooked thoroughly and set aside as the recipe states and cover in a bowl. Add mushrooms, garlic and a pad of butter to the chicken liquid and cook down until the the mushrooms are tender and most of the liquid has evaporated. Add the mushrooms to the bowl of chicken and cover. Add the sauce ingredients but DO NOT ADD SALT. 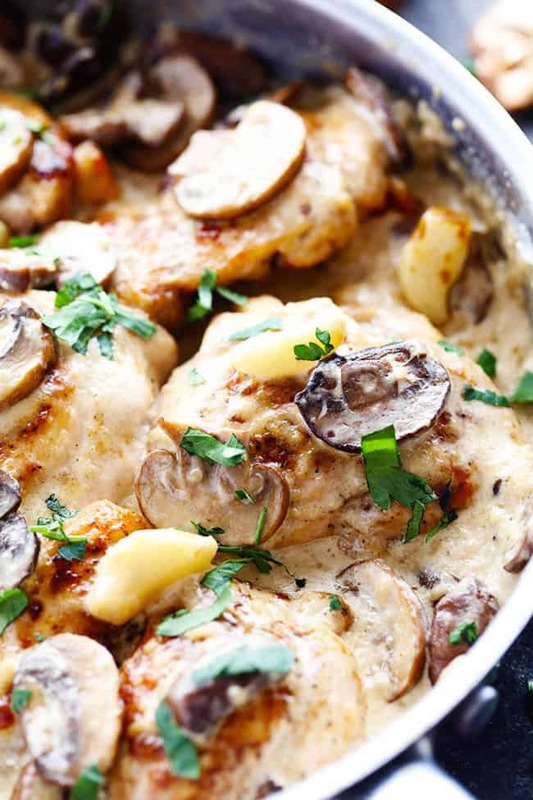 Cook in the same skillet so it absorbs the chicken and buttery mushroom garlic flavors left behind. 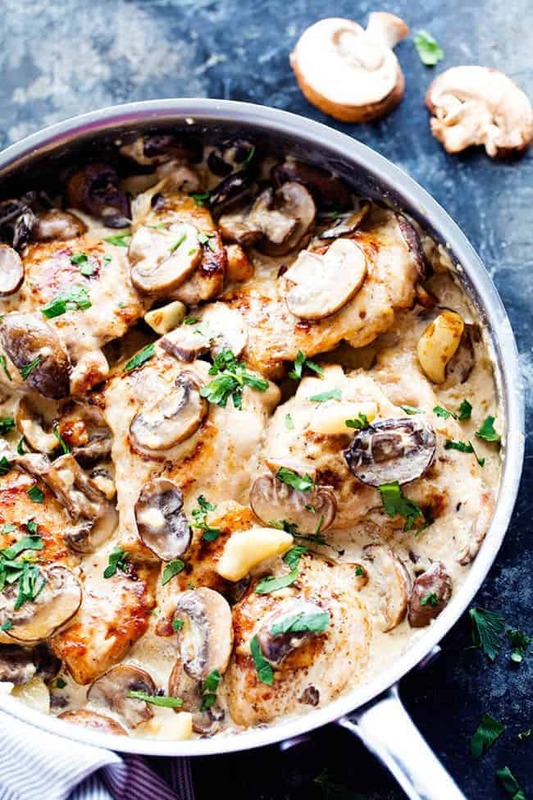 Once the sauce is thick, return the chicken and mushrooms to the sauce, evenly coat and serve immediately topped with a tiny bit of parsley (italian or curly) and a sprinkle of shredded parmesan cheese which will add more than enough saltiness. Thank you, thank you, thank you! I thank you. My friends thank you. My family thanks you. My unborn children thank you. This is so good it almost brings a tear to my eye. Yummy but there is no mention of spinach like the video shows? The spinach is optional. You are welcome to add the spinach after the cream sauce is made and let it soak in with the chicken. Hope that helps! What a winner of a recipe, simple and soooooo delicious! Thank u for sharing!